In our core room we have an extensive inventory of over 1000 SKUs. 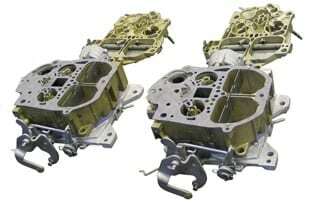 Each unit is inspected upon receipt to ensure that the carburetor is rebuildable. Our remanufacturing process begins by disassembling the base, body and air horn of the carburetor. 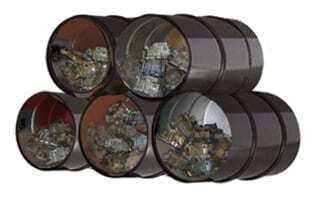 During this process we also discard several internal parts including: gaskets, needle and seats, plunger caps and any other internal parts that are damaged or do not meet OEM specifications. After disassembly, all internal parts are inspected and cleaned in industrial equipment. All zinc and steel castings are chemically processed to restore the factory finish. All aluminum castings are sandblasted to restore the finish. The salvaged internal parts are cleaned in the same fashion as the castings. Following the cleaning process, our pre-assembly team inspects and tests the carburetors’ internal parts including: electric and vacuum chokes, throttle position sensors, floats, accelerator pumps, etc. If internal parts are damaged or do not pass inspection, we replace them with new parts. The next step of the manufacturing process is the assembly area. Our experienced assemblers piece together each unit and adjust all internal and external parts to conform with their original factory settings. All of UREMCO’s carburetors come equipped with new needle & seats, gaskets, gas filters and accelerator pumps. Following the assembly process, each carburetor is tested on our flow-bench engine simulator for quality control. Adjustments that are made by our technicians to meet OEM specifications. These adjustments include: the choke, idle speed and idle/air screw, and other areas. This process allows each of our carburetors to be installed directly from the packaging. No product leaves the plant until it meets or exceeds all OEM specifications. All carburetors are shrink wrapped and packaged with a mounting gasket, where applicable, to be used in the installation process. What distinguish UREMCO’s carburetors from the rest are our employees and their experience. We have been in the remanufacturing business since 1948 and many of our employees have been with the company for upwards to 20 years.